Experts have called on anyone who felt a recent earthquake in France to complete a questionnaire. The call follows a trio of incidents in different locations. The largest of the three was a 4.9-magnitude quake on the border of Charente-Maritime and Gironde in Nouvelle-Aquitaine at about 11am on Wednesday. It followed an overnight 3.9-magnitude tremor that had its epicentre near Brest, in Brittany. Meanwhile, between about 8.20am and 9.40am on Wednesday, three tremors registering around 2.0-magnitude were recorded in the Var. The first was at the foot of the Esterel, 17km from Frejus, the second just over an hour later near the coast and the third in the western Var. The Nouvelle-Aquitaine tremor occured at a depth of 6km and had its epicentre 34 km from Coutras, 34 km from Pauilhac, 18 km from Jonzac or 5 km from Montendre. Witnesses reported feeling it in Gironde, Charente-Maritime, Charente and Dordogne. Seismologist Jérôme Vergne, of the Bureau central sismologique français described it as a "relatively exceptional event" because of its location. He told Sud-Ouest newspaper that the tremor struck "at the edge of one of the areas considered to be one of the least seismic in France". The last earthquake of equivalent magnitude and depth in that particular region was in 1759, the paper reported. Witnesses, mainly in the Angoulême, Bordeaux, Cognac or La Rochelle regions, described mostly "vibrations" and "tremors", lasting a few seconds. At 6 pm, the prefecture of New Aquitaine reported no significant injuries or damage, and only one intervention by the fire brigade "due to cracks in a house in Donnezac", in Gironde, just outside the epicentre of the earthquake. No incidents were reported at the Blayais nuclear power plant, about 20 kilometres from the epicentre of the earthquake, but Greenpeace stated in a statement that the plant still did not "meet the post-Fukushima standards required by the Nuclear Safety Agency for more than eight years". The Brittany tremor, with an epicentre at Plougonvelin (Finistère), 20 km from Brest and at a depth of 10km, occurred at 12.20am on Wednesday. 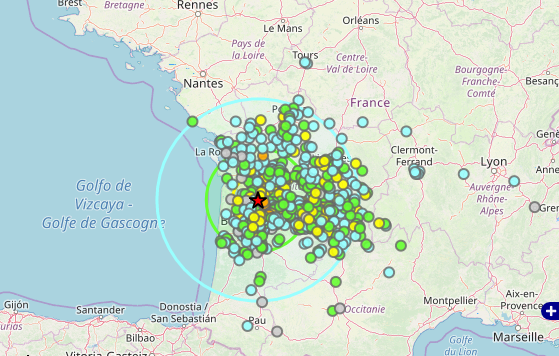 Small quakes are common in Brittany. Experts say the region - an ancient mountain range that is subsiding at geological slowness - experiences about 2,000 tremors a year, most of which are not felt by residents. In 1930 and 1959, the region experienced 7-magnitude tremors that could be felt as far away as Paris - much more powerful than the 3.7-magnitude quake on Wednesday.